And, it’s actually simple to make. No kidding! It’s a total showstopper that’s actually do-able. 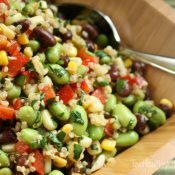 Just check out our little video tutorial to see how easily this beautiful salad creation comes together! But let’s get back to all that celebration-ness this salad’s got goin’ on. I mean … just look at it. Red pomegranates and green pistachios. You’ve got Christmas right there. Plus a snow-like dusting of goat cheese. Oh! And if it’s a celebration, we’ll be needing a bit of champagne, too – like maybe in a festive, light champagne vinaigrette! 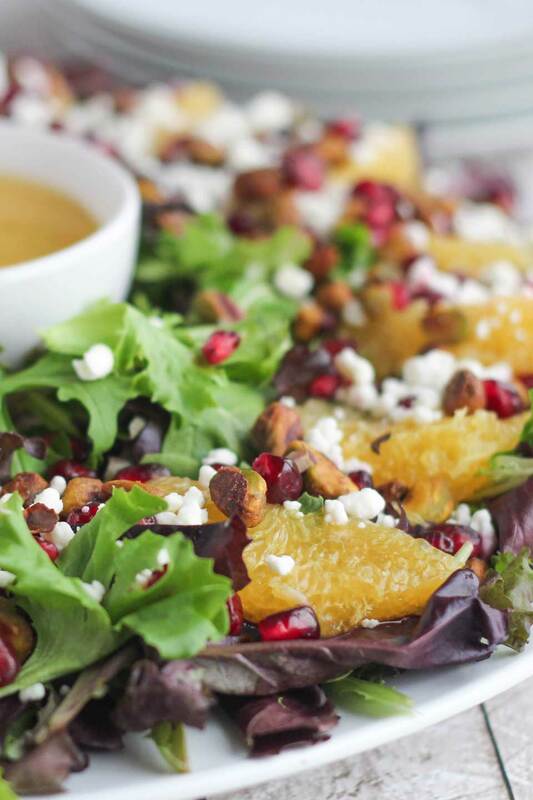 Now, I’m not going to tell you that you can’t make this salad for Thanksgiving, and allllll winter long, when you’re craving juicy, sweet oranges and a crisp salad to break up all that heavier winter comfort food. One taste of this, and serving it just at Christmas won’t be nearly enough. I get that. And honestly, I’m not gonna stop you from serving it at Easter. Or, heck – maybe St. Patrick’s Day and Cinco de Mayo, too. Who am I to judge? 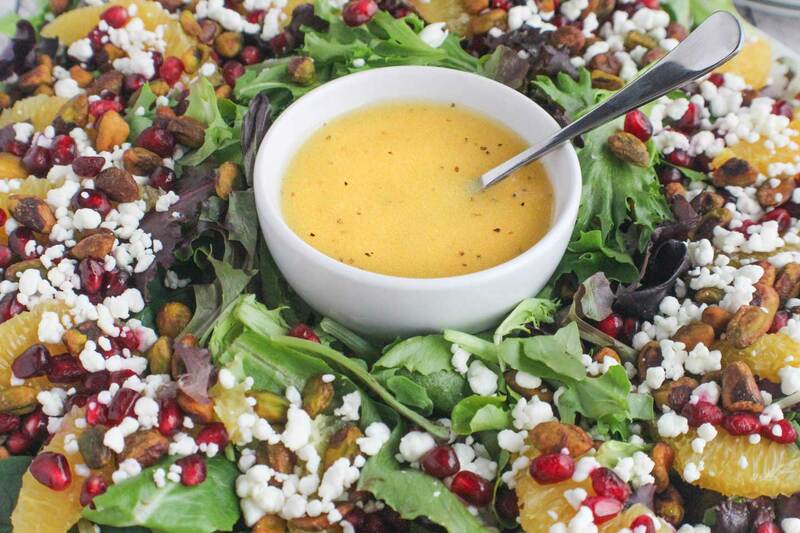 But in its heart of hearts, this salad is a holiday salad, a Christmas salad. A special new tradition you’ll look forward to serving each year. And with a few little tips, it’s a breeze to throw together. You can have it all prepped ahead of time, ready at a moment’s notice when your guests arrive! 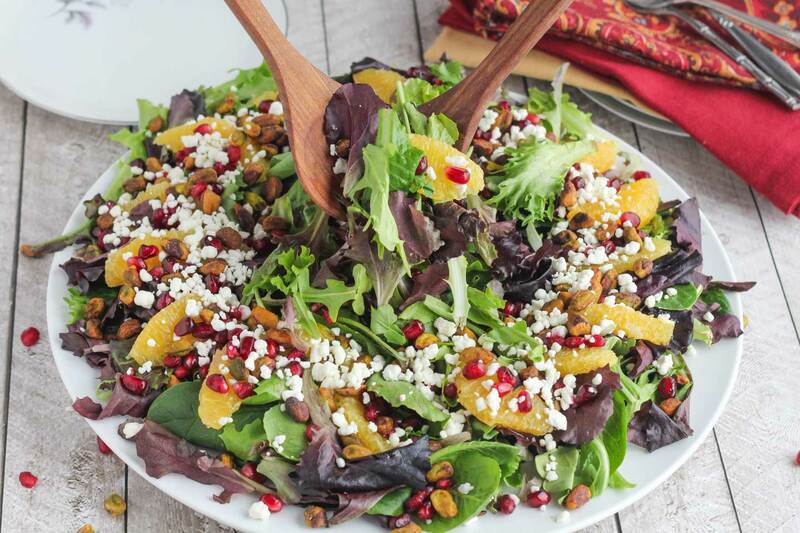 Greens – To make this holiday salad seriously quick and easy, we generally start with bagged greens, like a pretty spring mix or sweet baby lettuce mix. is pretty commonly stocked at my local grocery stores, but if you’re having trouble snagging it at your own market, you can grab it online, as well. 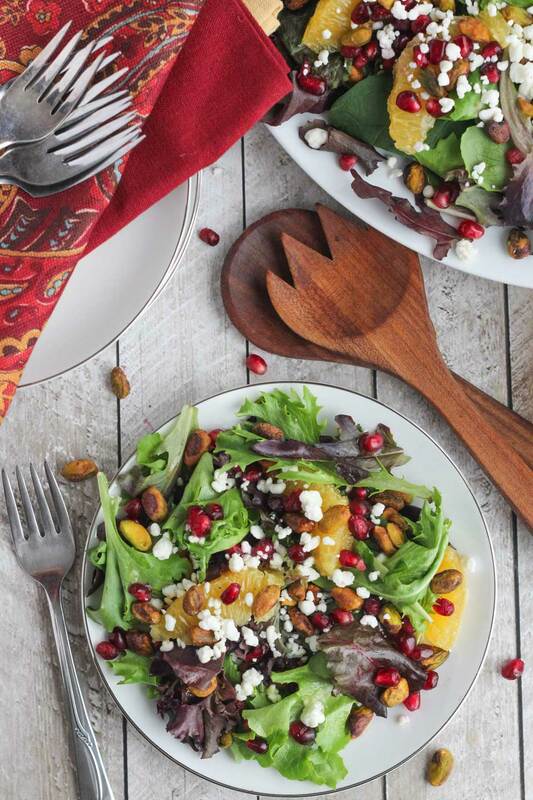 Pistachios – Although they cost a bit more, shelled pistachios will save you loads of time, and if you know you’ll be making this salad each Christmas, you can keep your eyes open a month or two ahead to snag them when they’re on sale. Storing nuts in the fridge helps extend their shelf life significantly, so you won’t have to worry about the pistachios going bad before the final, exciting moment when they get to adorn the Christmas Salad (the moment they’ve been waiting for)! Pomegranates – Another huge timesaver – the little containers of pomegranate arils that you can find in most any grocery store. Whole pomegranates are definitely a hallmark of the holiday season, so grab a couple for your centerpiece if you’d like, but save yourself the messy effort of extracting those pesky arils, and just buy them all ready to go. So easy! If you do choose to buy the containers, though, just be sure to drain off (and drink – yum!) the juice at the bottom, rather than pouring it onto the salad along with the arils. Crumbled goat cheese to the rescue! Grab it … and move on to the next item on your grocery list. Done! You know how restaurants always serve beautiful, perfect wedges of citrus without one bit of the white pith or membranes? Looks so impressive, right? Well, it’s super easy and will make you look like a chef extraordinaire! 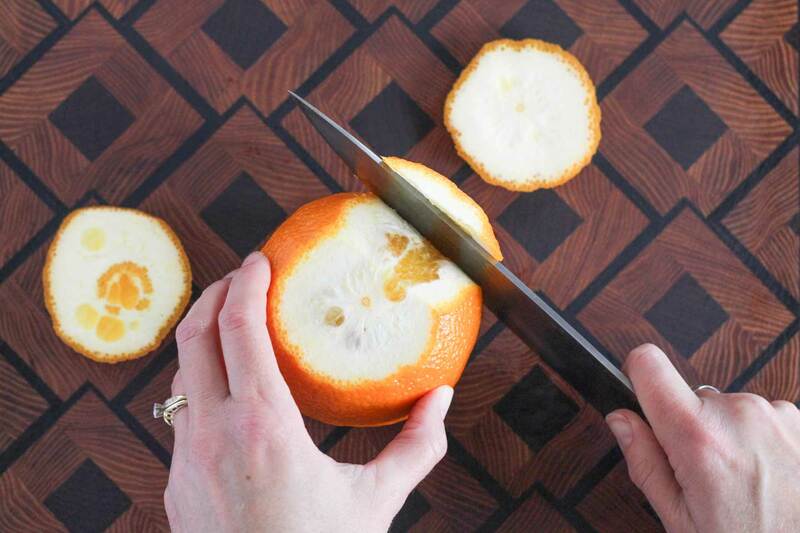 1) Start by cutting both ends off the orange, so you have a safe and stable base. 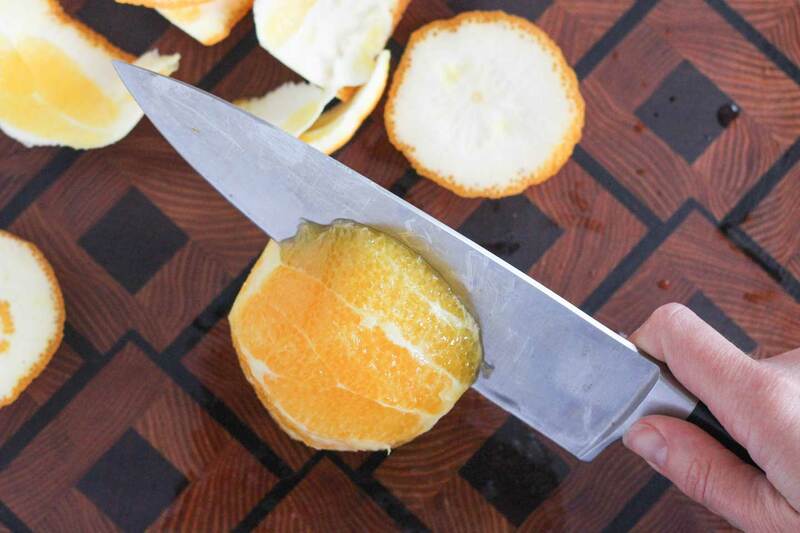 2) Turn the orange onto one end, and carefully begin to cut away the peel, starting at the top of the orange and slicing down toward your cutting board. 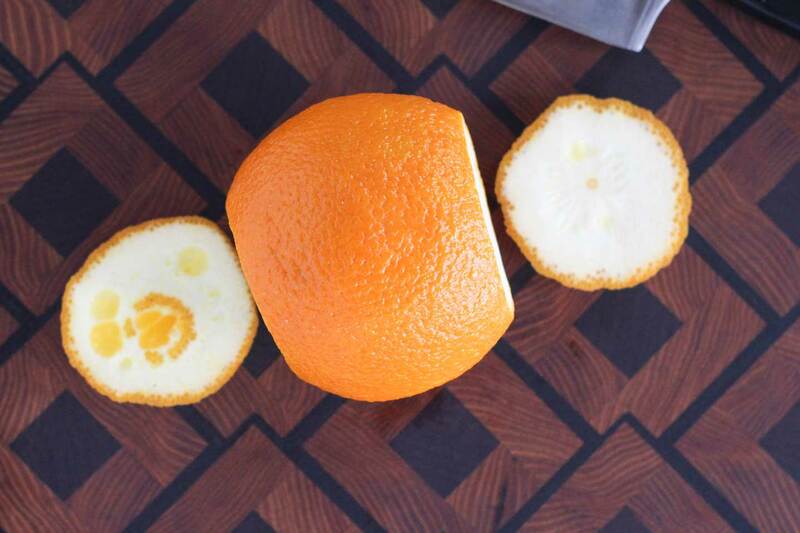 3) Follow the contour of the orange so you don’t cut away too much of the fruit itself – just the peel and white pith. 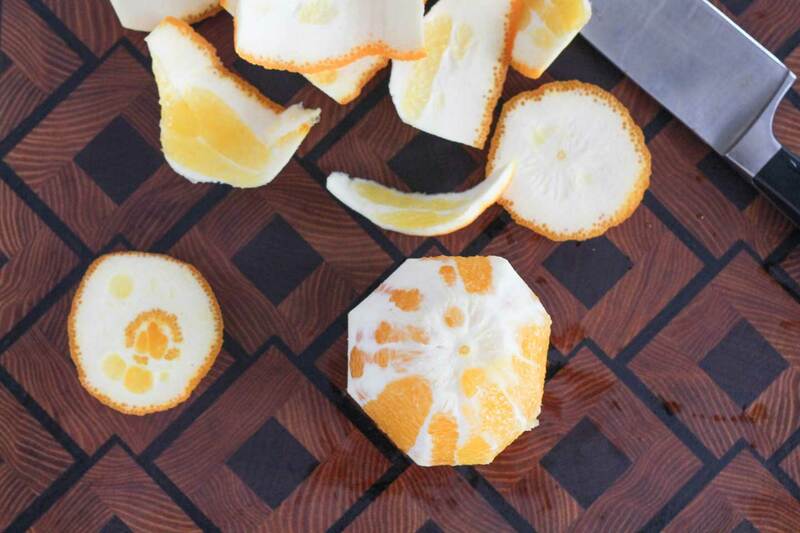 4) Work your way all the way around the orange, one area at a time. 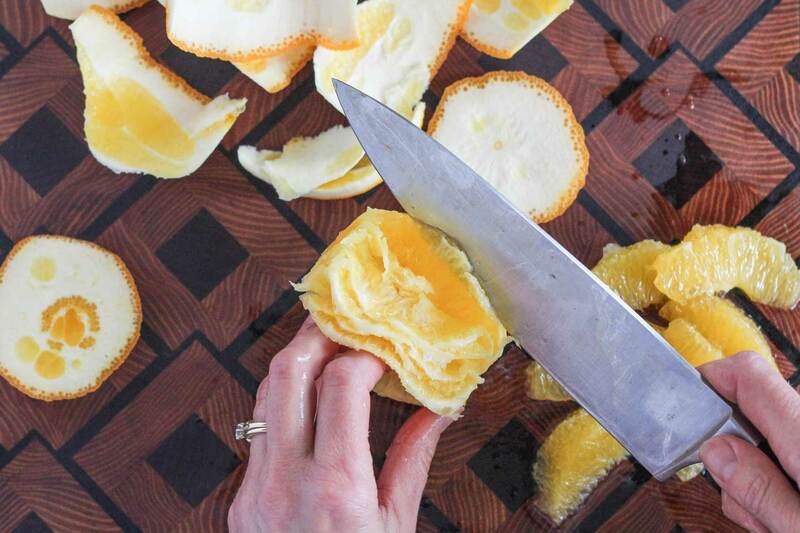 5) Once you’ve cut away all the peel, go back and carefully remove any little bits of pith that you missed. 6) At this point, you may choose to use a paring knife, although I prefer to finish the entire job with my beloved 8-inch chef’s knife (which is actually this one, and not the prop knife I grabbed for this photo shoot) – whatever you’re comfortable with and feel safe using is just fine. 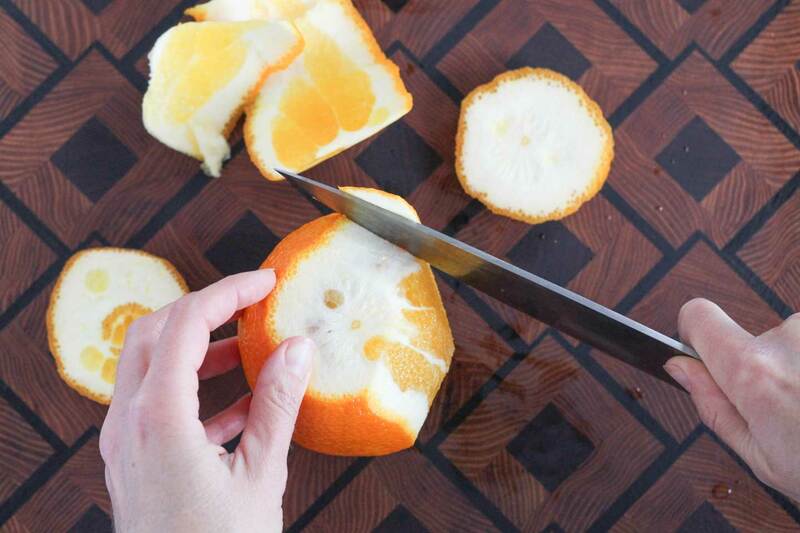 Next, you simply cut out each individual section of the orange, carefully slicing right along the membranes that separate the orange sections from each other. 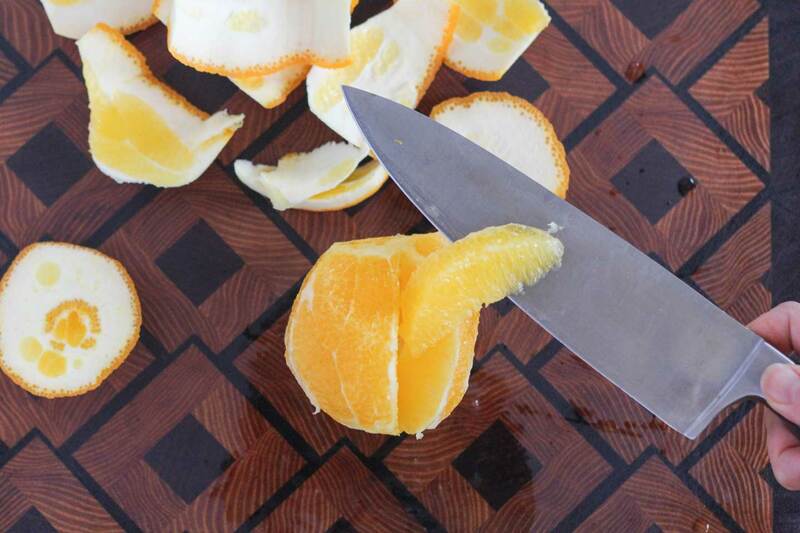 7) Cut just to the middle of the orange so you can remove each section while leaving the membranes behind, still attached together at the middle. 8) You’ll end up with an empty orange “core” and the attached pithy membranes, and also with a pile of beautifully supremed orange wedges, completely free of peel or pith! High five – you did it! I know that might seem like a lot of effort and steps, but once you’ve tried it once, you’ll get the hang of it and see that it’s really not tricky at all. I just tried to break it down for you in photos very clearly, in case you’ve never done it before. 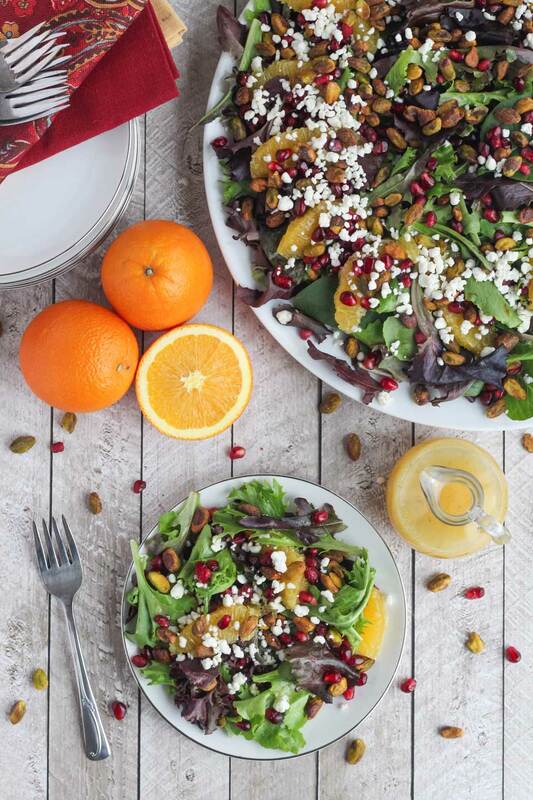 Trust me – although we’re usually all about quick and easy shortcuts here at THK, for a gorgeous salad like this one, it’s worth the effort to make sure those oranges are as stunning as the rest of the salad! 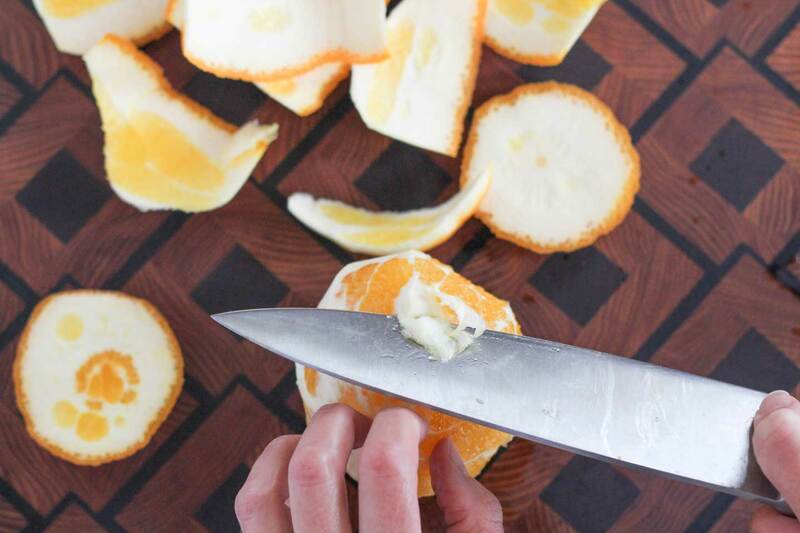 One little secret tip on those oranges while we’re at it. Before juicing the orange you’ll use to make the vinaigrette, let it come to room temperature, and you’ll actually get notably more juice. This salad can certainly be made an hour or so ahead of time, but all those (deliciously festive!) toppings can really weigh down the greens if you add them too far ahead, and the arils will start to turn the goat cheese pink after a couple of hours. Also, as with most any other salad, I don’t recommend dressing this salad ahead of time, to prevent it from getting soggy. In fact, you may just want to offer a cruet of dressing alongside and allow guests to dress their own. But wait … relaxed hostesses need to prep everything they can ahead of time, right? No worries – this salad comes together in mere moments! 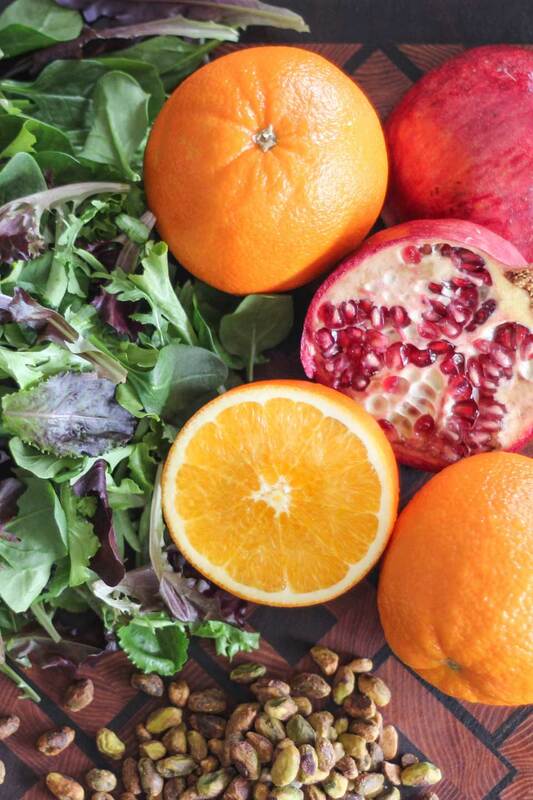 If you want to have everything prepped several hours in advance or even the night before, you can place your greens in their serving bowl, prepare the dressing, and supreme the oranges – and store them each in separate containers in the fridge. Just before serving, put it all together – and greet your guests at the door with a relaxed I’ve-got-it-ALL-under-control smile! 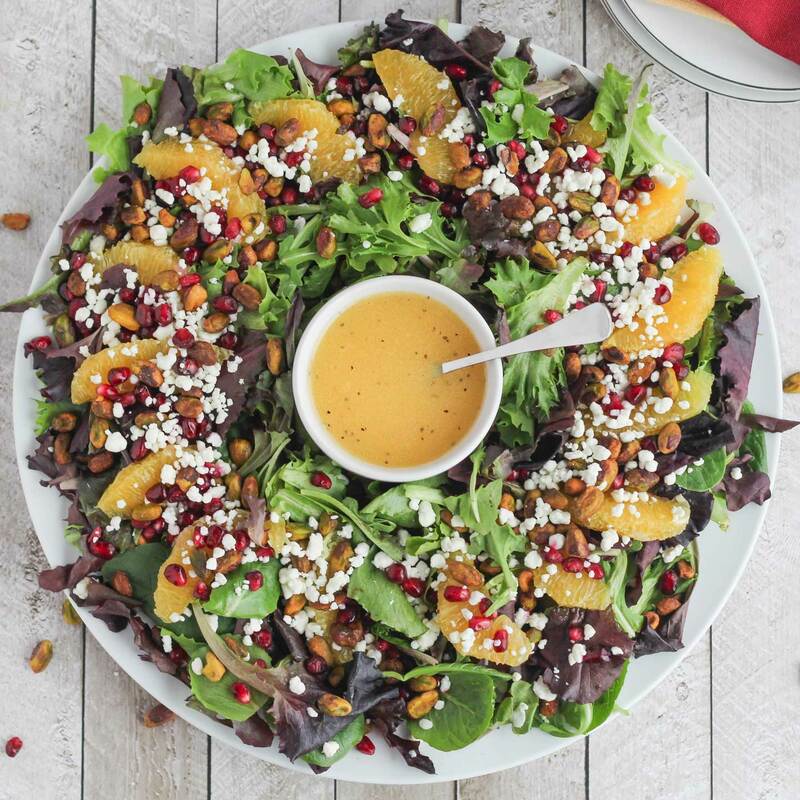 You may have noticed in our photos that you’ve got a couple of options for serving this beautiful Christmas Salad. But hey now … want to really knock their (festive Christmas) socks off? This salad goes into full-on wreath mode when you nestle a bowl filled with dressing right in the center. No doubt about it … that’s a Christmas wreath you’ve got there! Now it’s not just singing falalalala and screaming “celebration.” It’s become it’s very own Christmas decoration … a showstopping centerpiece! Happy holidays, friends! Gretchen and I both wish you a season filled with love and laughter, great food and good health. Cheers to you and yours! Place greens in a large serving bowl (or divide evenly among individual salad plates). 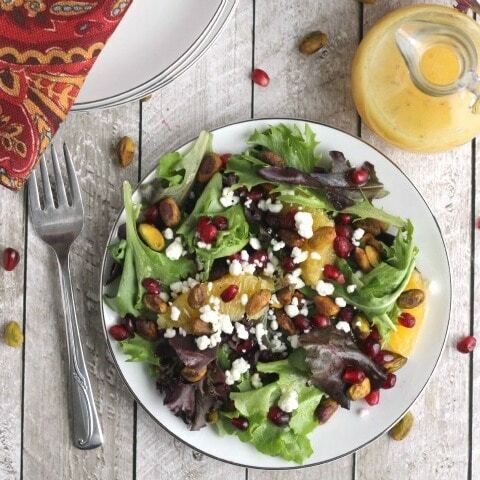 Arrange oranges, pistachios, and pomegranate arils over top of greens. Sprinkle with goat cheese. For dressing, whisk together orange juice, honey, champagne vinegar, canola oil, dijon mustard, salt, and pepper until the salt has dissolved and the dressing is emulsified. Dress salad just before serving, or pass the dressing at the table. 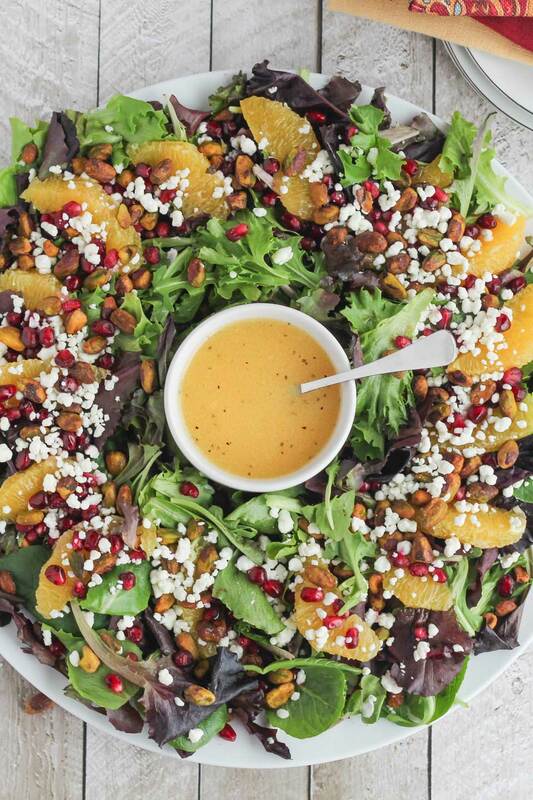 Make-ahead tips: The best way to prep this salad ahead is simply to have the dressing made, the oranges cut, and all of the components measured and ready. You can do this up to a day ahead, storing the greens, vinaigrette, oranges and goat cheese in separate, covered containers in the refrigerator. You can compose the salad up to about an hour before serving, but wait to dress it until the last minute (or allow guests to dress their own). This was a wonderful salad. I made this as a Christmas dinner side. So fresh and festive, had many compliments and requests for recipe. I’ve made this recipe twice now, once for Christmas dinner with my extended family and once for dinner with a guy I’m seeing. It was a HIT both times! Full disclosure, the first time I did not have champagne vinegar or pomegranate seeds so I used tarragon vinegar, pomegranate simple syrup and craisins (only thing close that I had on hand). I would say the goat cheese is a must to balance out the sweetness of the orange juice. I found I like the craisins too! In any case it was still fantastic, my Mom called me the next day just to tell me how much she enjoyed the salad. Thanks!! This was a hit at Christmas with my family. Many comments on how beautiful – not pretty – it was! It was delicious – each ingredient just made it really perfect. 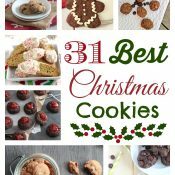 I might have to make it again next year for Christmas! and healthy to boot. Served it pre-tossed with dressing in the wreath-design as you did with a small bowl of extra pistachios in the middle. This salad was incredible! 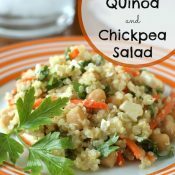 Great healthy side dish next to all of the heavy Christmas food! I brought this Christmas salad to a dinner with friends on Christmas day – yesterday. It was beautiful and it tasted phenomenal as well. It was a great side for the rib roast that was served. 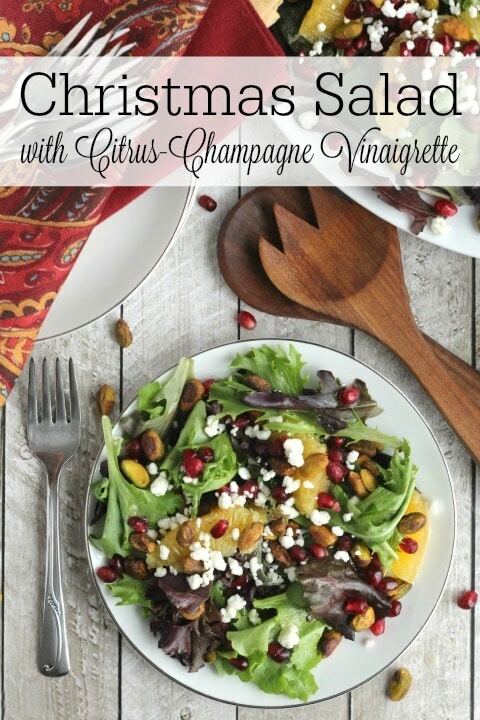 This is a beautiful salad and plan to make for Christmas Eve, but I’m having trouble finding champagne vinegar. I still have a couple more places to look for it, but if I can’t find it what do you recommend for a substitute? How many people does 11 cups serve? Hi, do you think blue cheese would be ok in this salad? Shelley, your salad was a hands-down pick to take for a Christmas party!~ It’s beautiful, I love the flavor profile of all the ingredients and can appreciate how well they’ll probably blend. I haven’t tasted it yet but it’s beautiful. The only issue was supreming the oranges (not to scare anyone off)-after I’d completed that task they looked too big on the salad. 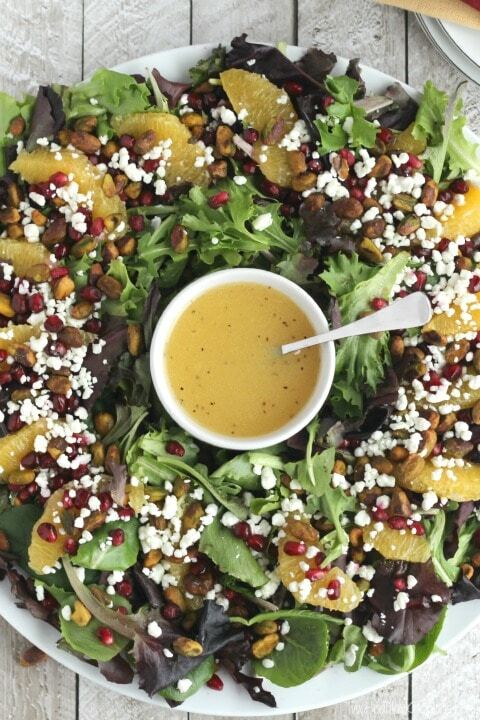 I’ll check back in to let you know how it went over…thanks for a simple festive and beautiful salad! Thank you SO much for sharing this recipe! It was absolutely delicious and everyone loved it, to include second and third helpings. It was also such a pretty presentation. Due to lack of time, I couldn’t run around to different stores to find champagne vinegar, but as luck would have it, I came upon a bottled champagne citrus vinaigrette dressing, and it paired perfectly. 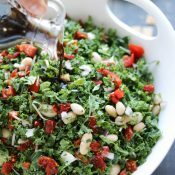 I always take some type of green salad to my m-in-law’s Christmas Eve due to their traditional ukraine/slovak, meatless, carb – filled and butter – laden meals, and I’m so glad I came across your awesome salad. I will most definitely make it an annual, traditional, signature dish. ☺? I brought all the ingredients tonight. After going to 3 stores, I found Champagne vinegar, but there were 4 choices. All different types, not brands of Champagne vinegar. There was a dry white oaky taste, a pinot citrus taste, a pomegranate taste and a lemon one. All Champagne vinegars. I ended up with Cuvee Champagne vinegar, blend of california pinot and chardonay grapes. bubling, crisp and dry floral notes of lemon and apple. I am sure it will be delicious,but didn’t know what to get. I will try it, tomorrow. Another question 🙂 what would you think about Grapeseed oil substitute for Canola? P.s. 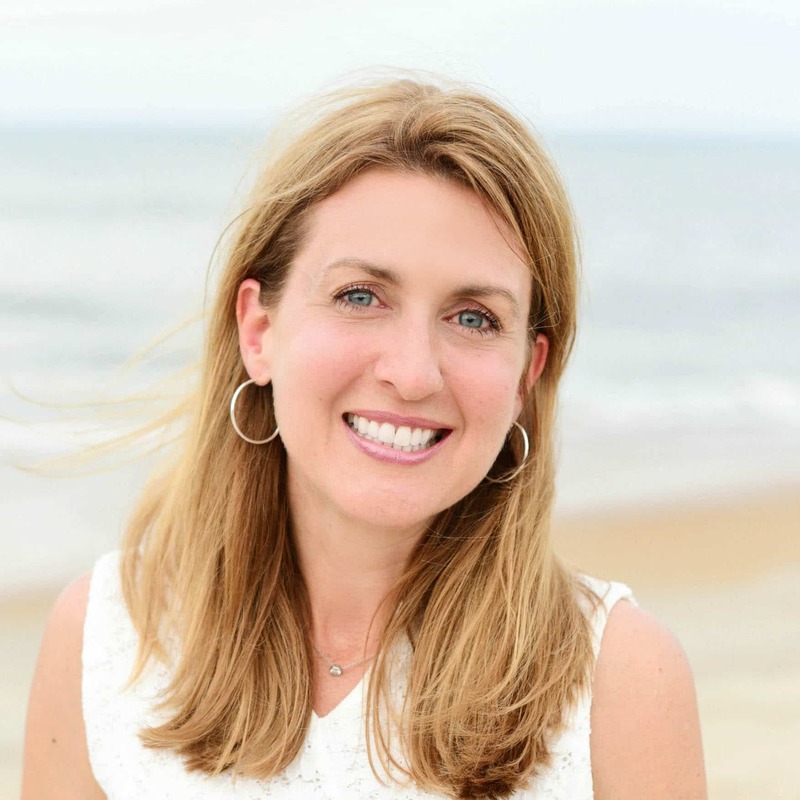 Thank you so much for including the very detailed and shopping and prep tips! So helpful!! Beautiful! Looking forward to trying to 🙂 About how many people does this serve? I’m making it for my BIG family get together of 20 so want to make sure I have enough 🙂 thank you! Thank you so much Shelley! I really appreciate your quick replies and very helpful info!! I’ll go ahead and double it and based on the amount of other food I agree that sounds like a perfect amount. With your test on 15 people at your big gathering I feel very confident about that too :). Thanks so much for the answer you gave on the grapeseed oil too, I’m going to try it as a substitute and I’ll let you know how the Grapeseed oil turns out! Thanks again and Merry Christmas to you and yours as well!! Love the way this recipe looks and want to try for Christmas eve, but not a fan of pistachio’s, do you think pine nuts or slivered almonds might work just as well? Can’t wait to make this! 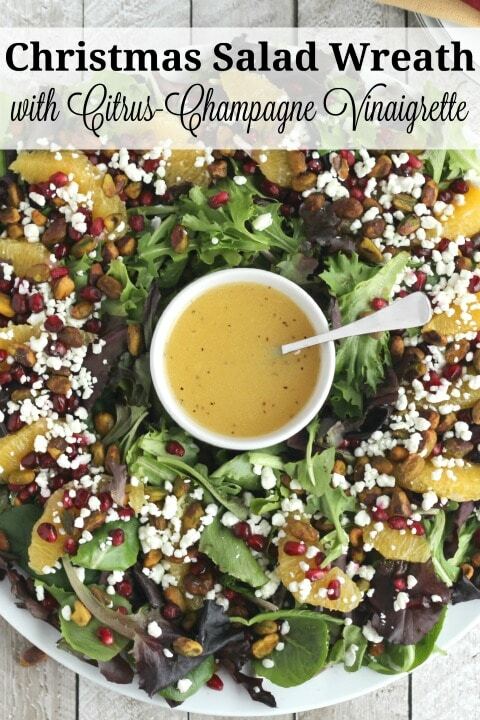 What do you think about grapefruit vs. the oranges in both the salad and the dressing? Your salad looks amazing!! I am looking forward to making it this year for Christmas Eve.Wondering what do you think of substituting feta for the goat cheese? Thanks! Thanks so much for your reply, I really appreciate it. Not being a fan of goat cheese though,can you think any other cheese you might go well in the salad? Wishing you and yours a very Blessed and Merry Christmas!! Love this! Thanks for the inspiration!